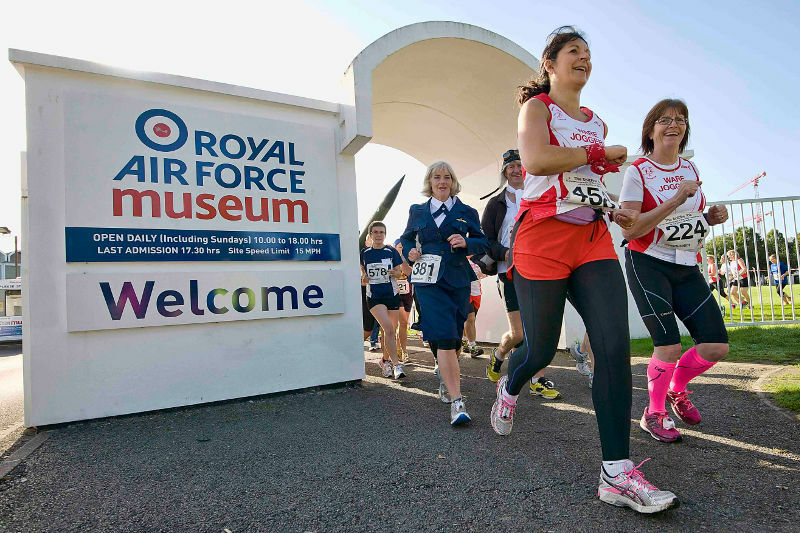 2018 marks the centenary of the Royal Air Force and as part of the celebrations and commemorations, the award-winning RAF Museum is inviting runners to take part in some exciting events to mark the once in a lifetime occasion and help raise funds for the RAF 100 Appeal. To celebrate 100 years of the Royal Air Force, the RAF Museum has set a new centenary year challenge to run 100K in 100 days. The Spitfire 100K Challenge is a virtual race which launches on 1 April 2018 and runners have exactly 100 days to walk, jog or run 100K in a location of their choice. Runners will be given a log sheet to record their 100K before being rewarded with a spinning propeller Spitfire 100K Challenge medal. Entry costs £20 per person and all proceeds from the Spitfire 100K Challenge will go towards the RAF100 Appeal, a joint venture between the Royal Air Force and four major RAF charities – Royal Air Force Benevolent Fund, Royal Air Forces Association, Royal Air Force Charitable Trust and the Royal Air Force Museum. As a virtual race, the 100K challenge can be completed anywhere in the world and runners from as far as America, Germany and Denmark have already signed up. Online registration is now open and closes on 1 April when the challenge begins. Limited edition Spitfire 100K Challenge t-shirts are also available to purchase when registering online. This year we are offering 800 runners the opportunity to run a 10K on our historic airfield site in North West London. 2018 is a big year for the Royal Air Force and for the Museum. We have three new exhibitions and a beautiful landscaped site, evoking the London Aerodrome from 100 year ago. You will start under the Sunderland and run through the site and then continue around the streets of Colindale, before coming back on site to finish on our ‘taxiway’. At the end of the race you will be awarded with an exclusive Spitfire 10K medal, which will be extra special for 2018 as this year will be the centenary of the Royal Air Force. T-shirts can be ordered when you purchase your Spitfire 10K entry and will be available for collection on the day. The deadline to pre-order your t-shirt is Sunday 12 August 2018. For 2018 we will also be holding a NEW Spitfire Family Run. This gentle run will take place around our transformed site. Each registered runner will receive a special medal upon completion. The race is suitable for all ages, but children under 16 years must be accompanied by an adult. Standard entry (all ages): £5 (this includes a medal). Please note that only paying participants will be awarded a medal. The Spitfire 10K is a UK Athletics licenced race over an accurately measured course and is suitable for keen runners and novices alike, so if you’re aged 15 and over why not give it a go? Whether you’ve been entering races for years, or you’re just getting into running, the Spitfire 10K is guaranteed to be fun and memorable. Organisers are also encouraging participants to get into the spirit of the Spitfire 10K by dressing in wartime attire – don your victory curls or flying jacket and run this event in style! Or, why not sport a bespoke 2018 Spitfire 10K t-shirt, available to purchase when you register online. The Spitfire 10K will be a fun family day out and spectators are invited to cheer on their loved ones and show their support on the day at the start and finish line. Plus, following the race, visitors have the added bonus of being able to enjoy time wondering round the free Museum, where they will find over 75 historical aircraft on display. To register for the event visit the Museum’s website www.rafmuseum.org/cosford. Entry to the Spitfire 100K Challenge is £20 per person, the Spitfire 10K costs £22.50 per person (Armed Forces Personnel and members of UK Athletics affiliated clubs are eligible for the discounted entry fee of £20.50 per person), and participation in the Spitfire Family Run is £5 per person. All proceeds will go towards the RAF100 Appeal (registered charity number 1167398). For further details about the event can be found online. We would like to draw your attention to a special event to be held at Bircham Newton in May 2018. 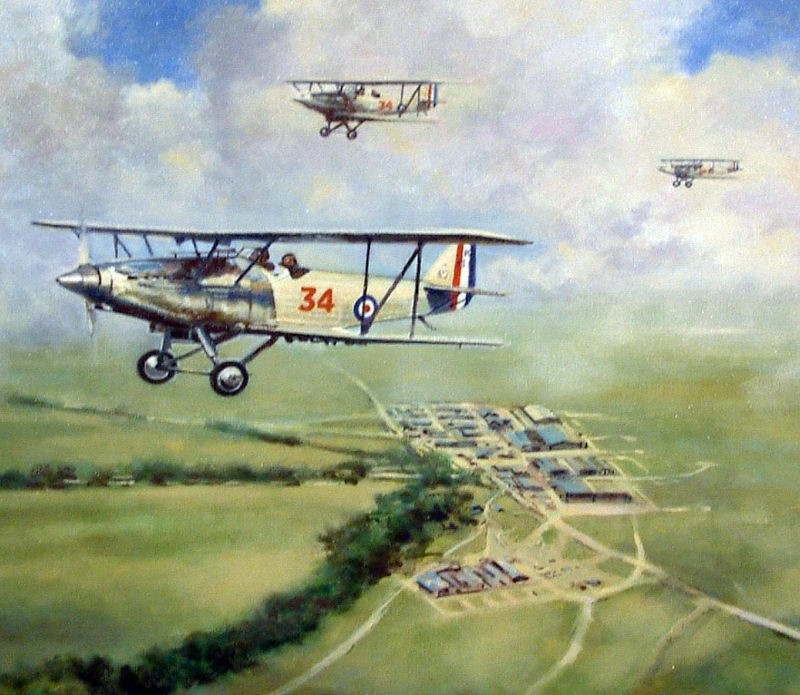 In addition to being the centenary of the birth of the Royal Air Force, 2018 will also be the 100th anniversary of the birth of the former RAF station at Bircham Newton. The first unit to fly from its airfield, No. 3 Fighting School, arrived in May 1918, just one month after the birth of the Royal Air Force. The Fighting School was soon joined by a second unit flying giant Handley Page bombers, designed to bomb Germany from this Norfolk airfield. Flying continued beyond the Armistice and throughout the inter-war years, increasing dramatically during the second World War. The station was finally closed in the early 1960s, during the height of the Cold War, but flying briefly returned in the mid-1960s, when trials of the Kestrel jump jet were conducted on the airfield. To mark the centenary of the birth of RAF Bircham Newton as a flying station, it is planned to hold a Veterans’ Day event at Bircham Newton on the afternoon of Saturday, 19th of May 2018. The event will be open to all former servicemen, who served or were trained at Bircham Newton, and their close families. The largest group of visitors is expected to be former RAF administrative apprentices, who trained at Bircham Newton in the late 1950s and early 1960s, but many other veterans are also expected to attend, such as former national servicemen, former members of the Women’s Royal Air Force and officers who were trained at the Officers’ Advanced Training School (OATS) or its successor the Junior Command and Staff School (JCSS). There will be many attractions for the veterans and their families to enjoy: the RAF Heritage Centre will be open for guided tours; an illustrated talk will be given on the role of Bircham Newton during the Great War; local history groups and service associations have been invited along to exhibit their material; military vehicles and large-scale model aircraft should be on display; local ATC squadrons and the Royal British Legion have also been invited to participate in a brief end-of-day ceremony, when the RAF ensign will be lowered to the sound of the Last Post. Tea, coffee and other refreshments will be available throughout the afternoon. It is also hoped to organise a short flypast, if possible. Entrance will be free and free car parking will be provided. Disabled access and toilets will also be available, and help will be given to those with mobility problems. Further details regarding location etc can be found on our website:- http://www.rafbnmp.org.uk Our postcode is PE31 6RB. 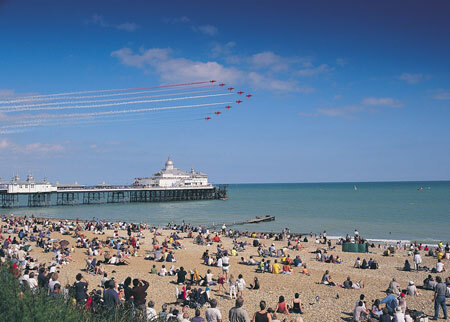 Airscene is giving one lucky person the chance to attend Eastbourne Airshow as a VIP with reviewer Dave Briers. As a VIP at Eastbourne you can expect: lunch, refreshments and arena side seats in the Pilots Enclosure. The VIP pass also includes a helicopter pleasure flight and the opportunity to meet with, and chat to some of the display pilots. You will of course be helping Dave; more than likely fetching his tea or holding his spare memory card while he takes the full one out of his Nikon. Dave will be more than happy to give a few pointers if you are a novice and will probably share a wartime story or two (Sorry Dave). To enter you will need to submit a VALID entry into this years calendar competition before midday on 10th August 2014. Please give your entry the subject “VIP entry” to ensure inclusion in the draw. Give yourself 2 entries in the draw by submitting 2 separate entries (max permitted). **Anyone who has already submitted an entry can send a blank email with the subject “VIP entry” to be eligible, however Early Entry Phase entries ARE NOT eligible. Please do visit the sponsors, hopefully you will find something you wish to purchase. This is after all what keeps the competitions going and the prizes coming in. Mark Jarvis, Martyn Crookston, Adrian Glazzard and Robert Clarke all look set to join the 100 club this year – fingers crossed… Martyn Crookston is by default the man to beat again this year – 2nd place on the Ranking Total column with 79 points, but there will be no entries from the current 1st place as Ken Brannen jumps in as a sponsor this year – so the pressure is on Martyn! 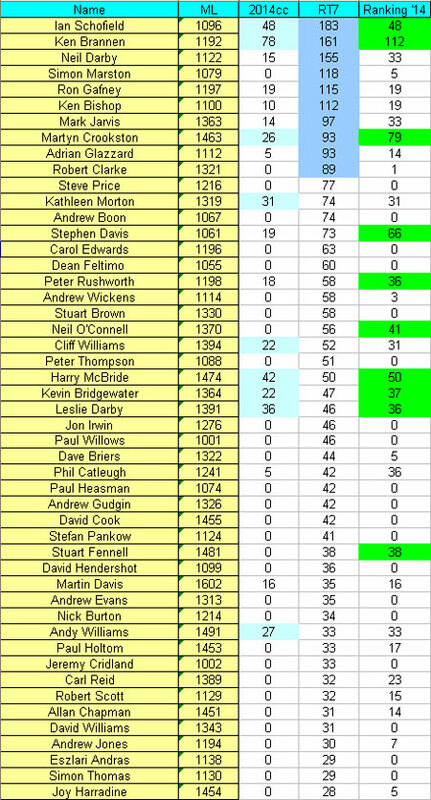 And will Ian Schofield retain his stranglehold on the top and break through into the 200 club (if he does he will likely be the only member) – the only other person who could join him is Neil Darby, but the quality of entries keeps on getting better and it is doubtful whether one individual will stand out on their own. Looking forward to receiving your entries, Good Luck! This years competition opens officially this coming thursday (1st May) and will close on 30th September 2014. Prizes have been coming in thick and fast with the latest contribution coming from Terry Jones Art ( www.terryjones-art.co.uk ), with two commemorative prints on offer. Both prints can be seen on the following page http://www.terryjones-art.co.uk/red%20arrows%20special.htm – the Jon Egging print has been allocated to first prize and the Sean Cunningham print to 2nd prize. Terry is very generously donating the proceeds from sale of both prints to the Jon Eggings Trust and The Royal Air force Benevolent Fund respectively. In the hope of winning one of these great prizes, it is understandable you may not wish to make apurchase at this time, but do please make a donation to either (or both) of these very worthy charities in the meantime. Just over 2 weeks remaining in the Early Entry Phase. Before the competition opens officially on the 1st May, there is an Early Entry Phase. During the Early Entry Phase entrants are permitted to submit ONE entry, but it MUST have been taken during 2013. There will be no further opportunity to submit this “extra” entry after 31st March. All entries received in this phase will be reviewed and shortlisted during April. Maximum of 25 entries will be shortlisted, so regardless of the total number of entries received, some may not make the cut. The Main Phase opens on 1st May and closes on 30th September. During this phase entrants are permitted to submit TWO entries, both of which must have been taken in 2014. The UK’s largest aviation publisher Key Publishing Ltd have today confirmed their prize offering for this years competition. Your prize can be used to purchase magazine subscriptions such as Air Forces Monthly and Flypast, books, models, flight sims and even DVD’s. You don’t have to limit yourself to aviation prizes either as Key also produce railway, modelling, sport, and military publications. Airscene is in discussions with several sponsors, and hopes to make further prize announcements soon. Airscene bumped into the proprietor of Covent Garden’s based Icon Stamp Art whilst doing the rounds at Dunsfold Wings & Wheels. After going to extradordinary lengths (buying a couple of framed pictures) Simon Coleman has kindly agreed to offer one of the Concorde 3D stamp pictures (as seen above) towards this years competition. All of Simon’s work is genuine, hand-made and 100% original – and uses real stamps. Following on in similar style (front, profile, plan), Simon has created a variety of artwork which includes the Spitfire and a beautiful bi-plane in profile only. Due to the hand-made nature of the pieces, the items available in the shop will tend to vary at times, however do contact Simon to let him know what you may be interested in, and if he doesnt have it, he wil let you know if it can be done. The Concorde piece retails for £30 (framed) and will be added to the first prize pot in this years competition. For further information about Icon Stamp Art, and to see the available collection please visit http://www.iconstampart.co.uk or leave a personal message at https://www.facebook.com/iconstampart. Next years competition will officially open on 1st May 2014, there are a few changes from previous years, and it starts with the early entry phase, which opens today. <<< The 2013cc winning entry. The early entry phase is for photos which were taken during the 2012 airshow season, max 1 entry per person/household in the early entry phase. Shortlisting for this phase will take place in April and there are only 25 places on the shortlist for early entries. Other changes to nexts years competition include a maximum number of available shortlist places (150 in total including the early entry phase) – each of the 5 months from May to September will have an allocation of 25 places, however unused places will be carried over to the next month. As usual sponsors will be contacted in the new year, so there are no prizes currently listed, but rest assured there will be a whole pot of goodies up for grabs again. For further information and to enter please visit http://www.airscene.co.uk/competitions/2014calendar.php. What are you doing on sunday 7th July 2013? Wrong! Well at least one of you is… One of you (namely the winner of this years calendar competition) will be going to RAF Waddington International Airshow (Waddo as it is affectionately know by its tens of thousands of fans) with a vehicle pass (for vehicle and up to 5 persons) courtesy of the team at Waddington. Waddo is one of the UK’s biggest and favourite airshows, with typical crowds averaging 140,000. This year saw the arrival of the Black Eagles in the UK, now there will be some who stop me to credit RIAT with this, but hey… Waddo showcased them first – all credit for having an earlier date in the calendar. The main purpose of the event is to increase public awareness and understanding of the RAF and its role today. All proceeds from the Air Show are donated to RAF and local charities each year. The spectacular 7-hour flying display normally features the fabulous Red Arrows, the Battle of Britain Memorial Flight, the RAF Falcons freefall parachute team and many more military and civilian aircraft from the UK; it is also heavily supported by military forces from around the world. Ground displays include 2 exhibition hangars, funfair, classic cars display, pleasure flying and much more!